Our Dear Niece turned 3! This was surprisingly good. This was the first time I made the miso-sesame dressing, and I must say, it was very good. It gets its own post! We still had puff pastry in the freezer, so I thought I'd do an onion tart again. 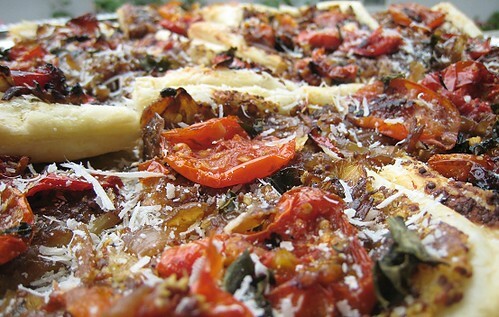 So that's grainy dijon, caramelized onions, basil, Parmiggiano-Reggiano and a new addition, some roasted tomatoes. 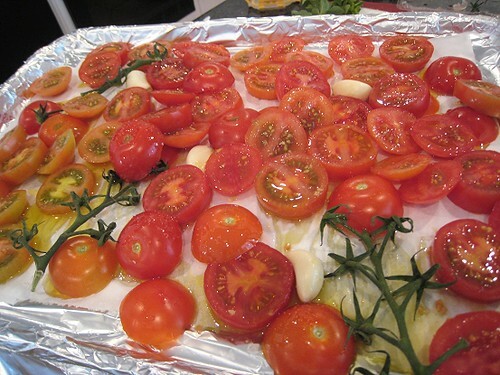 Here are those campari tomatoes going into the oven with olive oil, garlic and some of their stems for that extra tomato aroma. Done simply with olive oil, salt and pepper. So refreshing yet with deadly heat. 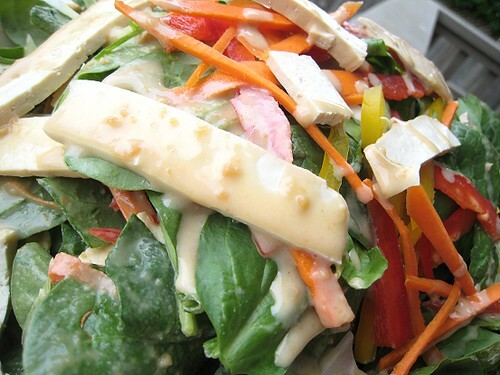 Our Asian-style salad was dressed with soy sauce, sugar, rice vinegar and sesame oil. Oh, and chile peppers (of course) and green onions too. Details. 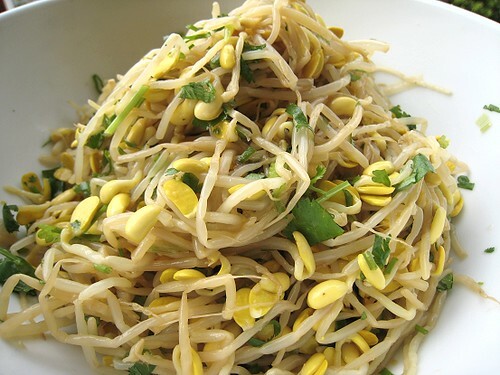 I very much dislike regular ol' bean sprouts, but I love these bigger-headed Korean sprouts! 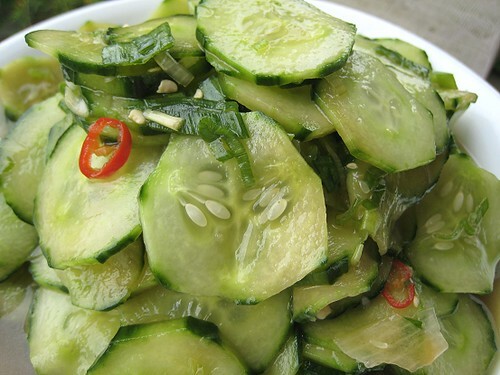 It's the same Asian dressing as the cold cucumber salad, but without the heat and with cilantro instead of green onions. Details. 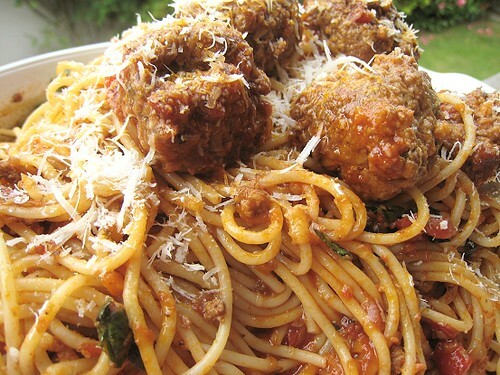 Of course, what children's party would be complete without spaghetti and meatballs? Besides, the celebrant's mother (that would be CSC) insisted on it. During the planning sessions, when asked about her opinion of the menu, CSC also kept insisting that she really did not care: she predicted she would forsake all others for the spaghetti. We don't actually have any idea on what "Congolaise" flavors are. We got this idea from a dinner at Chambar: nobody at our table ordered the mussels congolaise, but it smelled heavenly. 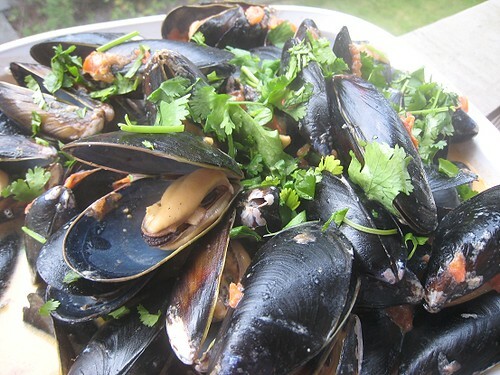 According to their menu, the mussels were cooked with tomato coconut cream, smoked chili & lime and fresh cilantro. JS took those flavors and made our own version. This was quite a discovery! JS found a recipe through epicurious. We'll talk more about this soon. Read all about them wings here. 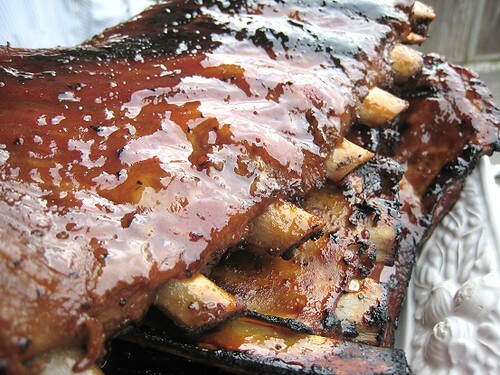 We justify "à la Chinoise" with the use of a hoisin-based glaze (with hoisin, honey, soy sauce and black pepper). 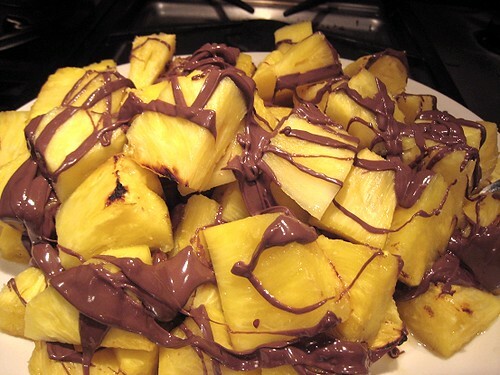 For dessert, we didn't have humongo piles of different items like at Mama's Birthday Party, just two simple things. This was surprisingly good. 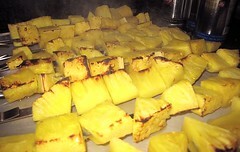 We didn't want to keep the grill outside on during the whole of dinner, so we decided to broil the pineapple instead. They're not quite as "grilled" as I would've liked, but they were still good. 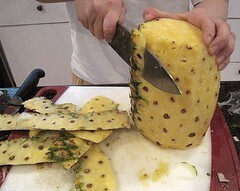 The pineapple itself that we bought was super-good. 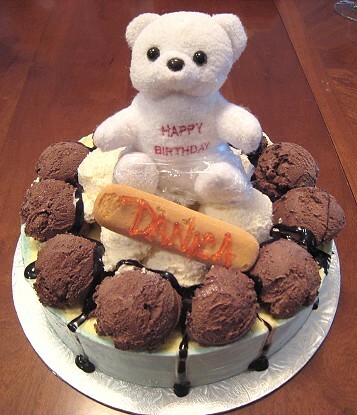 Of course, last, but not the least, the "Teddy Bear" Gelato Cake. The array and caliber of food is fabulous...I'd renounce Toronto and become a Vancouverite for a seating. 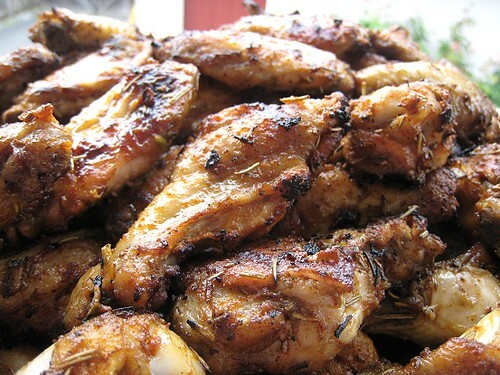 Finally, spill it on the Africa chicken, I'm still deciding on which chicken recipe I should use for my up coming BBQ. Thanks for visiting BURP! Looks like you have quite the drool-fest going on over here yourself. The watermelon salad looks scrumptious... as do the mussels Congolaise. I can taste the smoked chili already. The gelato cake looks awesome. Actually so does everything. I feel like I just ate a feast looking at all that food. And yes, please explain the Africana chicken. All those dishes look delicious! A great selection! 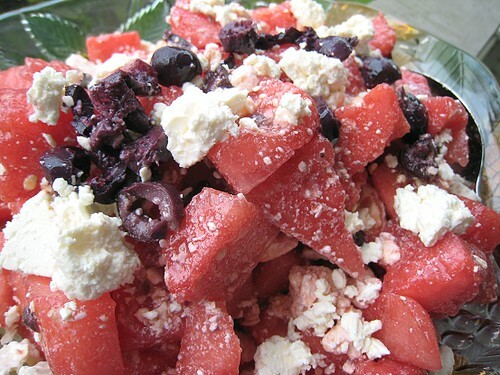 ooh, olives with watermelon and feta? 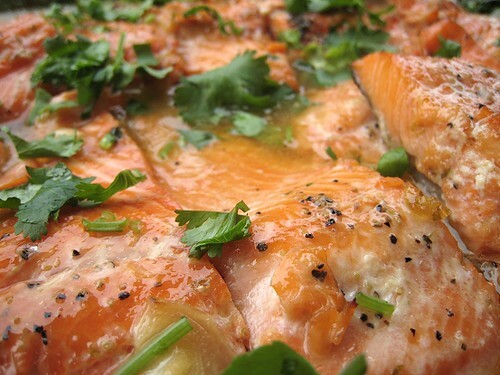 that sounds great....I'll have to try it and maybe add some pine nuts too. Well, we're now afraid of calling anything "Greek", haha. Oh yeah, Vancouver is the best! Food-wise, at least. This seems more of party for the adults than the kids :) The food you have here for this party is fantastic! Hope your niece had a good time. Good lord, I'm full just reading about it and looking at your wonderful photos! So much great lookign food! Haha, yes, the food was mostly "for adults". We did have the spaghetti there (and chicken wings), so that was our nod to thte children in attendance.